This entry was posted in Blog Posts and tagged How to, Silk ribbon embroidery, Stitches on 27th August 2014 by Zinaida. 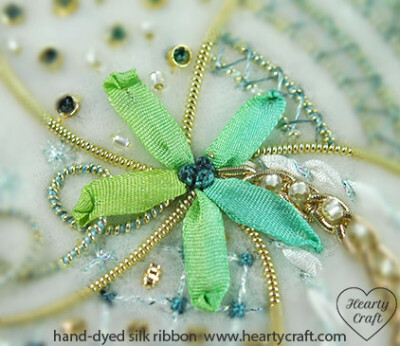 There are a few ways to end a stitch in silk ribbon embroidery. There aren’t any strict rules which method to use in any particular design or with any particular stitch, so you can pick out the one you like the most and stick just to it, or you can alter them whilst stitching. Some methods work only for narrow ribbons, so the options are quite limited with 13mm ribbons, but as for the most popular 4mm silk ribbon any method works. All in all, it’s a good idea to look through all the ways of ending stitches with silk ribbons, so you are fully armed with the basics. This method works well for all ribbon widths, and it is recommended especially for wide silk ribbons (7mm and 13mm width). 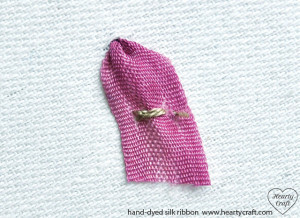 Using sewing thread that matches background fabric and an embroidery needle, stitch the tail of the ribbon with tiny stitches to the back of the fabric (see photo on the left). If you use two layers of fabric to support your ribbon embroidery, try to pierce only the lowest layer of fabric, so the stitches holding the tail in place are not visible on the front. In case you use only one layer of fabric, position the stitches so that they are hidden under the embroidery on the front. It might be a good idea to secure ribbon tails only after the whole embroidery is finished. If you decide to go for this option and leave all the fastening off to the end, try not to leave long ribbon ends dangling on the back. Clip them short, about 1 to 1.5 cm (1/2 inch) in length. Otherwise you’ll be catching and pulling those tails accidentally all the time, whilst stitching. You can also ‘weave’ those tails over and under the stitches at the back, so they are out of your way, but be sure to secure them with a sewing thread after you finish. This entry was posted in Blog Posts and tagged How to, Silk ribbon embroidery on 20th August 2014 by Zinaida. After I finished working on the first tutorial I just could not stop playing with spider web roses, so I ended up with another cushion! This time I arranged roses in a circle and added felt leaves among them to get the depth of a rose bush. I didn’t think twice about finishing, as my first cushion needed a pair. I followed my own steps by attaching strips of green fabric around the ribbon flowerbed and making the second cushion in similar style. This one is turned out more vivid and rich in colour, but they both make a perfect pair on my sofa. 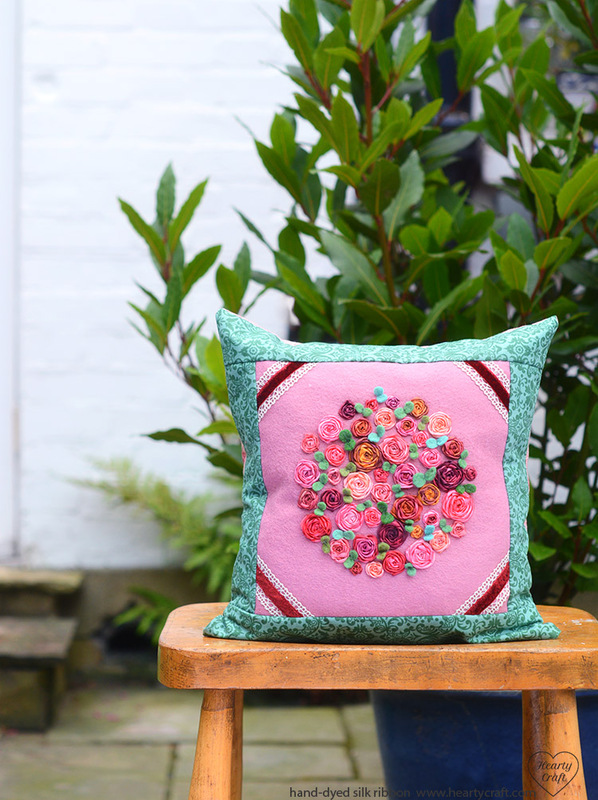 If you have been contemplating giving your sofa a fresh look, this could be a great pattern to start with because stitching the ribbon roses is quick, and sewing the cushion is even quicker! This entry was posted in Blog Posts and tagged Free Patterns, Silk ribbon embroidery, Tutorial on 14th August 2014 by Zinaida. Earlier this week I posted a tutorial on how to make straight stitches with silk ribbon, but I think you would agree that nothing is more boring than practising a new technique without a pattern or even an idea of what you’re stitching. Personally, I hate the thought of polishing a skill if it don’t end up in a nice piece, which I can frame and proudly hang on the wall. So I came up with an idea of making a series of posts with small, nice designs, that will give you a hand in learning basics of the silk ribbon embroidery. These designs will be easy in making, which is handy, for example, if one needs a gift at short notice. 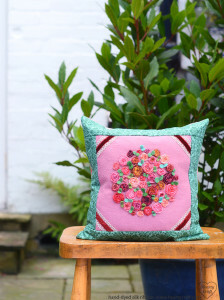 There already has been posts about stitching spider web roses and finishing the final piece in a cushion. Now here’s next tutorial for mastering the straight stitch. 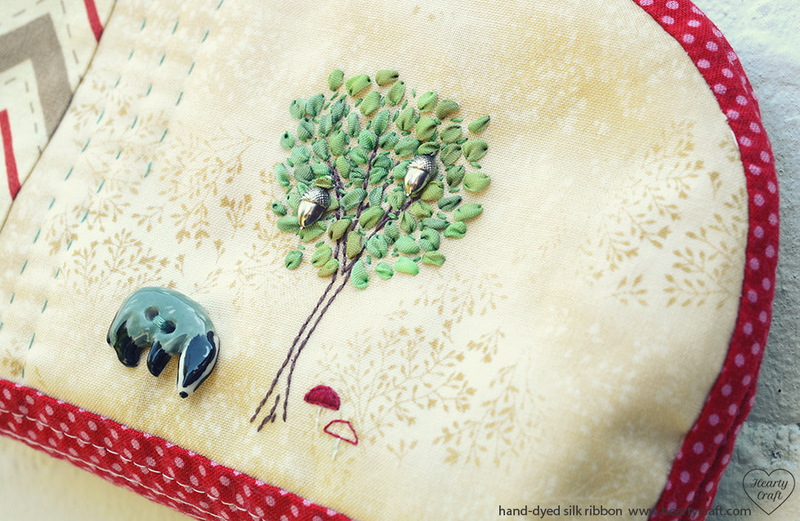 I am going to show how to embroider a tree with silk ribbons. This entry was posted in Blog Posts and tagged Free Patterns, Silk ribbon embroidery, Tutorial on 4th August 2014 by Zinaida.